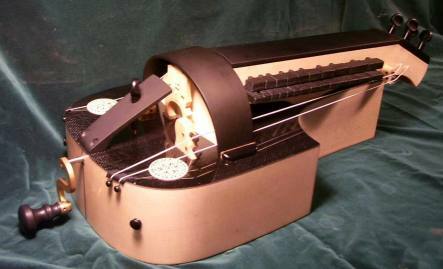 The Orca model is a modern styled instrument, with a single cutaway on the lower side at the head end. This production instrument is reliable and has many adjustments, with some special features that make it ideal for playing in almost any climate or environment. As a production model, this instrument is not available with any customization, but has a much shorter waiting time than our custom instruments (weeks or months rather than years). Here's a sample of the Orca: Orca sample. At first the sound is just the strings being placed on the wheel in succession, then Cali plays a traditional bourée called "Bourée de Aurora Sand". The legend is that Frédéric Chopin wrote down the tune when he heard it played outside his window at Nohant, which was George Sand's country house. 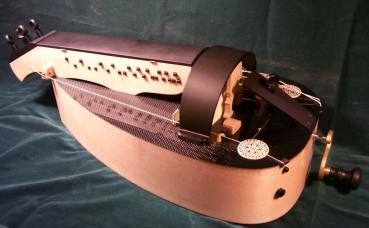 Here's another short sample of two hurdy-gurdies on a Baroque duet: Baroque sample Cali is playing an Orca model, and Alden is playing the first Volksgurdy we built. For the base price on this model and prices on the options, see the pricelist.